It's Marvelous Middle Grade Monday at Always in the Middle and #IMWAYR day at Teach Mentor Texts and Unleashing Readers. It's also Nonfiction Monday. 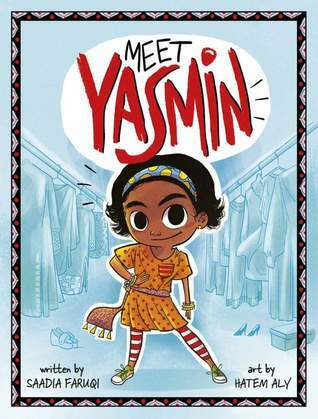 Second grader Yasmin has lots of adventures in her ordinary life. She explores her neighborhood with her mother, getting just a tiny bit lost, has some difficulty deciding what her artistic talent is for a school art show, struggles with a class project centered around building things, and gets in a little trouble while her grandmother and grandfather are babysitting her and she raids her mother's closet. Despite her sometimes misguided enthusiasm, Yasmin manages to succeed in her endeavors with the help of her supportive family. Strengths: This nicely illustrated beginning chapter book is sort of like a Junie B. Jones for the new Millenium. There are nice touches of Yasmin's family's Pakistani culture that frame her typical second grade adventures. I especially enjoyed the portrayal of her struggles with painting and building. Weaknesses: None of the other characters have eyes quite as large at Yasmin's. Also, like Junie B., Yasmin misbehaves a bit. I don't imagine her mother was pleased to have one of her items of clothes hot glued back together after Yasmin ripped it! What I really think: This is a must purchase for elementary libraries. It's a bit young for my readers (getting separated from mom is a middle school dream, not a nightmare! ), but an excellent addition to a diverse collection of beginning chapter books. If Yasmin ever hits middle school, I'd be glad to buy the book! T'Shawn's family is struggling to make it in a economically challenged neighborhood in Chicago. His mother is working, but his father died of cancer, and the family is still struggling with the bills. To make matters worse, his brother Lamont has spent the last two years in jail for robbing a local restaurant and beating up the owner. T'Shawn has a good friend in Dontae, but an uneasy relationship with schoolmate Carmela, whose father is a police officer. When Lamont comes home, T'Shawn is angry, and the close knot community is upset. T'Shawn takes some refuge in starting on a diving team run by one of his teachers, Mr. Hundle, who has secured a scholarship to the elite club. It's a different world, and fellow swimmer Sammy has very overbearing parents. Lamont isn't exactly a problem at home, and even helps with younger sister Rochelle, but he makes everyone uneasy. Several incidents put Lamont in a bad light, and the neighborhood even puts together a petition for his ouster from the community. T'Shawn is okay with this until he finds out some more information about Lamont's progress. Strengths: This was a positive look at a close knit community that is facing challenges. T'Shawn's family and neighbors watch out for each other, there is a strong church base, and children are interested in education and are well disciplined. There are not many books that show this kind of community, so it was good to see. There are realistic struggles to be faced, but there is a lot of constructive interaction, even when Dontae, T'Shawn and Carmela have a very unpleasant run in with the police. The swim and dive team is interesting, and the racism that T'Shawn has to face is sad but realistic. There's a lot going on (there are also subplots with the homeless shelter at which the family lived, and with Sammy and his pushy parents), but everything is clear and easy to understand. Weaknesses: This could have used more editing. It's on the long side for middle grade, and T'Shawn does tend to go on a bit too long about the things that are bothering him, which drags down the progression of the story. What I really think: Will purchase a copy. Many of my students love to read about gangs and life in urban settings. This is less heavy than something like Parker Rhodes' Ghost Boys, but still addresses issues of current relevance. Both of these books sound great! I especially want to try Courage: it seems like it combines a lot of topics and themes very well. Thanks so much for the reviews! These sound like two very different reads! My daughter would probably enjoy the Yasmin book. Thanks for sharing! Thank you so much for sharing these two detailed reviews. I've read several posts about Meet Yasmin, but really have a better feel after reading yours. I do have some learners who will probably enjoy this one! 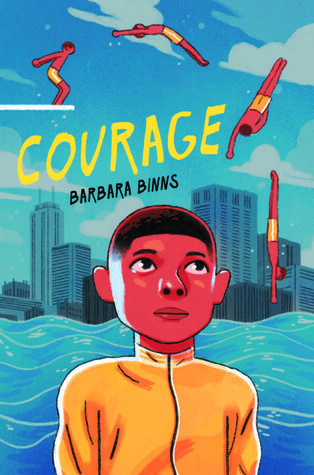 I'm also interested in reading Courage. I especially like hearing that it's not quite as heavy as Parker Rhodes' Ghost Boys for those readers who aren't prepared for that much depth. Thanks again, and have a wonderful reading week! I have seen blurbs about these two books but didn't know exactly what was inside until reading your reviews. Length in middle grade books is a huge concern as many kids judge a book by its weight rather than its content. Thanks for the heads-up on these new books. These both sound like interesting reads. My first grade students used to love the Junie B. Jones character and her adventures. Thanks for sharing this duo for MMGM. Any books that have something to do with swim is a book I want to read. As a swim mom, I can relate to a lot of swimming things :) Just finished Yasmin myself. Really enjoyed it. Yasmin looks so sweet, and I've been hearing a lot about it recently, I'm looking forward to adding it to my collection! Every time I read your blog I am filled with admiration with how much information you impart about books. I will be on the look out for Meet Yasmin! because I am interested in encouraging more voices and perspectives for young readers. I have Meet Yasmin on my list, will share it with my granddaughters, and Courage is a new title. Thanks for the detailed review, Karen. It sounds good! Whenever I've seen Meet Yasmin online I have assumed it's a picture book, I don't know why! I am glad to have read your review, and glad you have told me I must put it in my classroom library! ;) Will do! I feel the same about Yasmin--it is a must get for elementary!